This Terengannu dessert is not for the faint hearted. It's called "Jump and Stab". Yes, that's what it means in the Malay language. LOL. I'm just pulling your leg. It's a dessert for anyone. No violence incurred during the preparation and nothing happened when I ate it, except mourn with pleasure. LOL. Kelantan state has their own version that comes with a red glutinous rice and the coconut milk component is more liquidy like a curd sauce. So, please do not be confused. 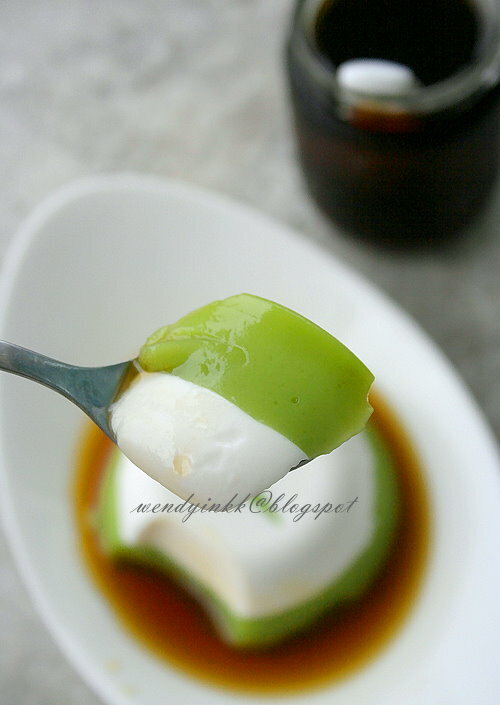 Ok, now, if you are a pandan, coconut and palm sugar lover like me, you'll go Ummmmmmmmm with this dessert too. Almost like a panacotta, absolutely delish! Soft, smooth and the combination of my favourite flavours. It's also super easy to make. Cook and pour... only! Oppps.... you still need to chill if you want it cold, but can be served warm, no harm having something less chilly. Now, for MFF, it's not a must to make something different than others, the important thing is that one tries to cook some state food. Try this if you're a pandan coconut and palm sugar lover and you won't regret it. 1. Prepare 4 ramekins (150ml capacity). Wash and dry them properly. 2. Combine white layer ingredients and cook on medium heat until it thickens, turns glossy and no longer taste floury. Distribute evenly into the 4 ramekins. 4. Combine green layer ingredients and cook on medium heat until it thickens, turns glossy and no longer taste floury. Distribute evenly into the ramekins over the white layer. 5. Chill for a few hours before unmoulding to serve. 6. Prepare syrup: Combine and cook until the palm sugar melts and smells good with pandan. Strain and let it cool down. Keep chilled until time to serve. 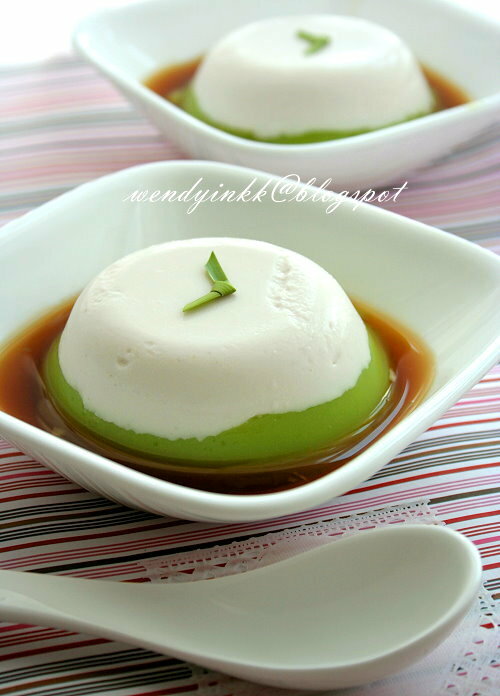 *Take note that you can serve this as verrines, just reverse the green and white layers. Serve with the container intact. So simple to whip up this good looking dessert! Oh dessert, my favourite! Beautiful presentation! Looks really delicious. My guests will be very happy if I serve this to them! Ahh...a classic TGG kueh. When I studied at the residential school in KT, one outstation classmate complained "kueh ni tawar, lah". She did not realise got syrup to go with it. Nice one, Wendy! 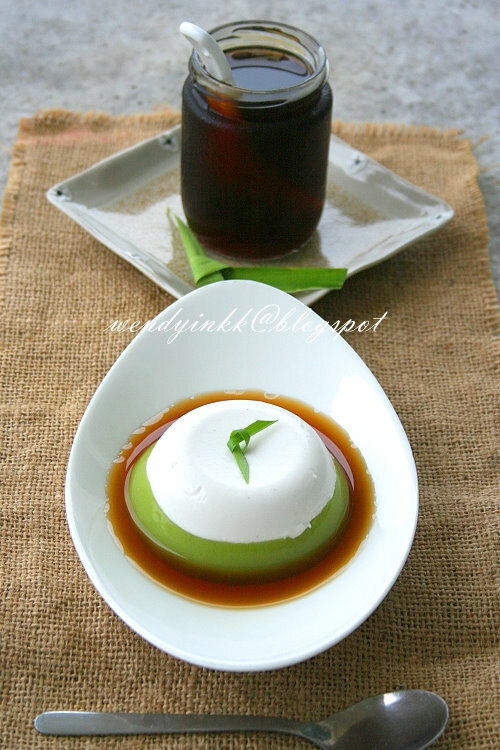 The jelly was decorated with a little pandan ribbon, so cute..totally change the presentation. Am impressed !! Wow, lovely presentation. This is dessert for the soul! The texture looks very delicate. Really curious how soft the texture will be. Got to try make it and find out. Very nice presentation! Smooth and perfect texture..on top of Lena's Roti Paun, I shall go look for this Lompat Tikam too when I go KT next week..lovely presentation. I like all the ingrediens used in this recipe, interesting name too. hehehe, mesti theme minggu ini membawa banyak dejavu bagi Chah, hehehe. Apa kata, Chah pun masak Ganu jugak, join kite for the event? Yawoh, the kuih itself is totally tasteless!!! LOL, did your fren love the kuih later? Haha, actually I put the 'ribbon' there for photography purposes, need a point of focus and it balances out the lighting, cos I'm on auto mode. It'll look weird if it's too white the lighting will be very off de. Yeah, my soul was filled after eating it, truly satisfied! Much much easier than kuih talam! I had this in KK instead,hahahaha. this is good man! i think most of us have a weak spot for gula melaka and coconut, so beautiful..! sounds like a kuih talam pudding hor? I think most of us in this region do too! That 1 drop is enough to make a difference. But if u're not using real pandan, but artificial pandan, you can use water. Most kuih in this region also lebih kurang, depends on the consistency and type of flour used, all really traditional ones are always about coconut, pandan and palm sugar, right?, hehehe. 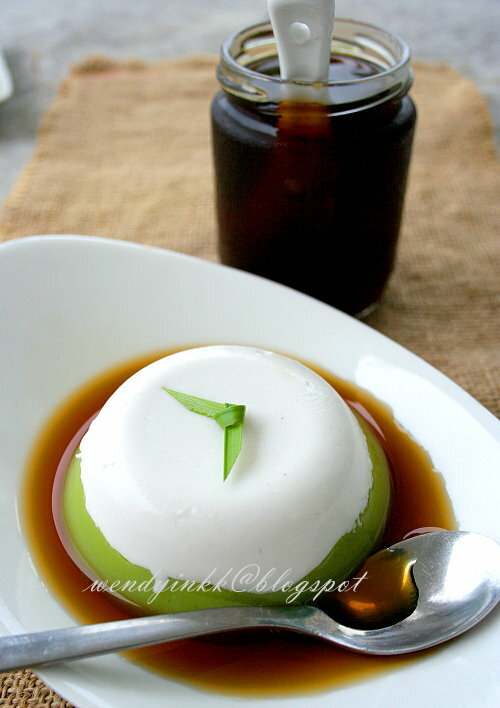 this dessert looks v pretty..would like to make it except that i dun have alkaline water.. and i have pandan paste. if i use pandan paste, how much should i use and just add one drop of water to replace alkaline water? will the steps still be the same? if u're using pandan paste, just skip the alkaline water. That 1 drop, ignore it, hehehehe. How much pandan paste to use depends on brand, some are more intense, so u have to gauge it urself. Can you tell me the ratio for the pandan leaves and water to obtain the required 400gm juice. It's hard to tell the ratio as the leaves comes in all sizes and quality. Better ones need less to achieve this colour and paler ones need more. 1 cup of loosely packed snipped leaves should be enough. Did you use young pandan leaves plus the whitish parts?